Clay Tech: Junior Tennis Solution? Or Tennis Solution in General? Clay Tech: Junior Tennis Solution? Or Tennis Solution in General? Scott and Brad on Clay Tech. Love the court and the forehand technique! Is ClayTech a possible answer for American junior tennis? Or for clubs, especially in California, where clay courts are unknown and not ecologically viable? What about as a teaching court for a celebrity coach like Brad Gilbert? The answer is possibly yes to all. Clay Tech is a new high tech red clay court that is cheaper to build, far easier to maintain, requires exponentially less water, but plays like the best European red clay. I know because I was lucky enough to get invited to hit on the one Brad has at his house at an event to introduce the court in the Northern California tennis community. Every time I go to the East Coast or Florida I try to hit on clay. There is no way to describe how much I prefer it for so many reasons. But it virtually does not exist in California. If you listen to Brad's commentary, you know he has been on record for awhile saying that one of the critical factors in the development of more American players is more play on clay. "The Europeans, the South Americans, they all grow up on clay," Brad said. "I feel the US is behind on recognizing and incorporating clay into the junior events. It should be a mandatory surface if we are to succeed on an international level moving forward." Everywhere else in the world, players grow up on clay. "The most important opportunity for growth for a young up and coming junior is clay! My advice to juniors is: play as much on clay as possible. The clay surface brings out the best of discipline and most importantly footwork." After the preaching, Brad decided he needed to walk the talk. So he installed a Clay Tech court at his house in San Rafael, California..
How does he like it? "ClayTech is a genius surface. So happy to have it as my home court surface. My only regret, not having installed clay sooner." So what is Clay Tech? 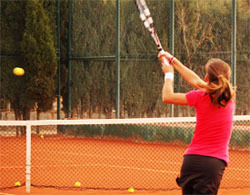 It has the unmistakable bright redish orange look of a European clay court. There is a reason for that. It basically is one. The most important component in the court is the crushed red brick in the top layer, imported from Italy. I looked In Brad's shed and there were the 50 lb bags, labeled in Italian. If you've played on European clay or on har tru in this country, this surface will not disappoint you. I had the privilege of hitting on it for a few minutes with Brad himself and I instantly loved it. A true Clay Tech bounce in high speed video. By the way Brad has amazing rhythm on his groundies. He naturally dropped down to my pace and we were having 10 ball rallies. That was fun. The rave review isn't just because I got invited to some event and got to hit with Brad. For a second opinion, I brought along my esteemed Tennisplayer colleague Scott Murphy. Scott knows red clay very well, having spent several summers teaching and playing on it in Italy. He's also a hard man to please--try watching him order a "thick" milkshake at a burger joint sometime. What did Scott think? Well, once he got on the court, he refused to relinquish his spot, skipped the wine and hors d'oervres, and just kept hitting through most of the event.So yes he liked it. How did he describe it? "It really is like European red clay. It has a very similar speed and a similar bounce height," he said. "Except the bounces are better." "The clay didn't relinquish or gather. I expected to be digging a hole staying in that one spot for an hour, but it didn't happen." So what is the actual composition? The subsurface is a carpet with a membrane that is laid down over a concrete or asphalt base--and yes it will install directly over an existing hard court--as is the case at Brad's. Then the crushed brick dust is laid in. But this top layer has far, far less material than a traditional har tru court. A membrane and a carpet laid over a hard court, filled with Italian brick. Believe it or not, there are 40 tons of hartru in the top layer of a typical American green clay court. Yes, 40 tons. That's a depth of about an inch. You also have to add a ton or so a year to the keep the top coat correct. Clay Tech takes 85% less clay. It's about 6 tons in total to create a depth of only about a quarter of an inch. After it's installed, compared to har tru, you only to need about half as much additional clay a year, maybe a half a ton--like 20 of the bags in Brad's shed. Then there is the water issue. In California, it's probably immoral to install a traditional har tru court as we enter year 5 of the worst drought in 500 years. Har tru needs 500 to 1000 gallons of water a day. Yes, 500 to 1000 gallons per a day. Multiply that over a year and see how selfish the idea of building a har tru court makes you feel. And har tru courts needs that much water every single day even if you aren't playing on them all the time. Otherwise they come apart and have to be rebuilt. Clay Tech needs water, but far, far less. Around 140 gallons a day. That 140 gallons may still seem like a lot, but to put it in perspective that is the equivalent of about 3 showers. If you still feel that is unjustifiable, think about this. It takes almost a thousand gallons of water to produce that 8 ounce steak you ate the other night. Could we be lucky enough to see Clay Tech catch on in California? But here is another huge factor that reduces total water consumption. You only need to water it on the days you actually play on it. The rest of the time it's fine on its own. What about price? Cheaper than HarTru. About $50K for Clay Tech if you put it over an existing hardcourt, compared to $70K or $80K to build har tru. Will they catch on in California? God I hope so. How about a California clay court junior training center? Maybe that would be too logical to actually happen but we can hope. I wrote Brad and his lovely and gracious wife Kim who co hosted the event a thank you note, so worst case, I hope to get invited back to play on his court at least once more in this lifetime.